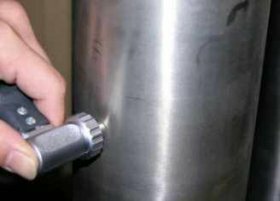 Ultrasonic Examination (UT) is a type of nondestructive testing commonly used to find flaws in materials and to measure the thickness of objects. 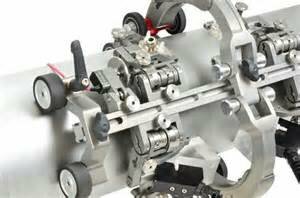 Inspection may be manual or automated and is an essential part of modern manufacturing processes. Ultrasonic testing uses the transmission of high frequency sound waves into a material to detect imperfections within the material or changes in material properties. 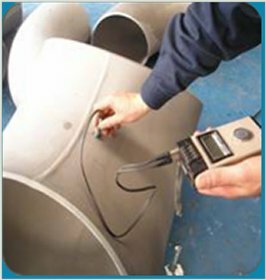 The most commonly used ultrasonic testing technique is pulse echo wherein sound is introduced into the test object and reflections (echos) are returned to a receiver from internal imperfections or from geometrical surfaces of the part. In simple terms, an ultrasound transducer is moved over the material being inspected, emitting pulsed waves of high frequency sound which travel through the subject matter and return to the transducer or a separate receiving device. Changes in the amount of sound received reveals imperfections in the subject material. One of the more common uses of this NDT technology is weld inspection on pipelines, where ultrasound is particularly adept at locating areas where the weld is not deep enough or fully complete. Tilley Pressure Test performs ultrasonic.